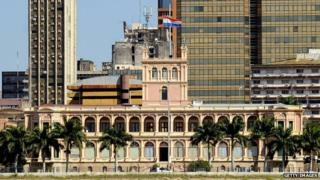 Architects say a termite infestation is threatening Paraguay's presidential palace. "They're damaging the wood structure, the floors and the wooden covers, which support some parts of the palace," architect Gustavo Glavinich said. He said much of the iconic building's west wing had been damaged. Mr Glavinich also warned that other parts of the 19th-Century building had not only been invaded by termites but also by bats. "In 2012, we invested $5m (£3m) to save those parts of the palace which house the presidential office, the military cabinet, and the ceremonial room," Mr Glavinich of the Public Works Ministry said. But he warned that a lack of follow-up investment meant that other parts of the Palacio de Lopez been left to deteriorate. The architect suggested taking immediate measure to tackle the termite infestation and to temporarily move the offices from the west wing to an annex. The palace in the capital, Asuncion, is the seat of the Paraguayan government and home to the office of President Horacio Cartes. Building work began in the 1850s under the direction of English architect Alonso Taylor, but the palace was not finished until 1892.